IMMEDIATE SHIPMENT: Ships out in 1-2 Business days after Payment ! Modular design enables users greater space for extension. As the core of this printer, the switchable platform plays a vital role. It allows users to take advantage of the reserved holes on it to adapt various nozzles, like laser transmitters, CNC cutters and so on. Besides, the aviation aluminum alloy connector, processed by surface adonization and CNC, is the privilege accessory for Ares to meet multi-functional connections. Most of all, you can design your own connectors to adapt your extended tools. The function of your 3D printer can be instantly upgraded and converted, as long as the adapter or connector matches the reserved holes. In addition, with up to 15 ports, the aerial socket for wiring provides possibilities for unlimited upgrade. 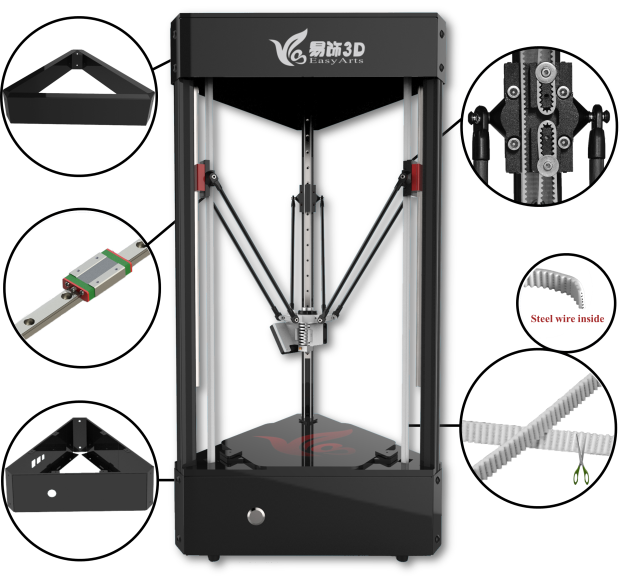 Similar to many other 3D printers, PLA filaments is the main consume materials in terms of 3D printing function, as it is both friendly to human and environment. So of course you can make colorful and complex 3D samples and even products. Particularly, the minimized gap between the moving parts significantly prevents apparent staircase effect on the surface of printed models. Surprisingly, Ares can print tiny model even smaller than finger. As laser engraving is very popular to DIY makers, Ares series are also equipped with laser engraving kits. 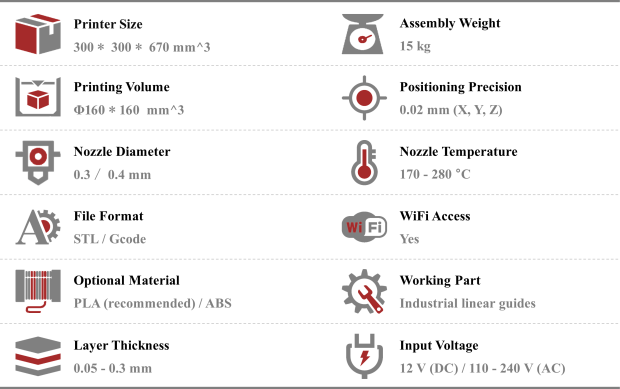 In consideration of practicality and safety, we think 300mW power will be enough for daily DIY. For instance, you can engrave your logo or picture on a card, leather, or wood, and even cut the paper into your design. In view of practicality and safety, the CNC engraving kit for Ares consists of a motor (maximum speed - 4000 rpm/min) and milling cutters of various sizes for corn. So now 3D pictures are available for you by engraving patterns on the cork and wood. Besides, you can design arbitrarily complex 3D models to form your exclusive wooden carvings in relief. 3D scanning, or 3D reversion, just makes your creation and extension simpler and easier. With laser line scanners, and high-definition cameras, Ares can deal with most of daily objects very well in high resolution. 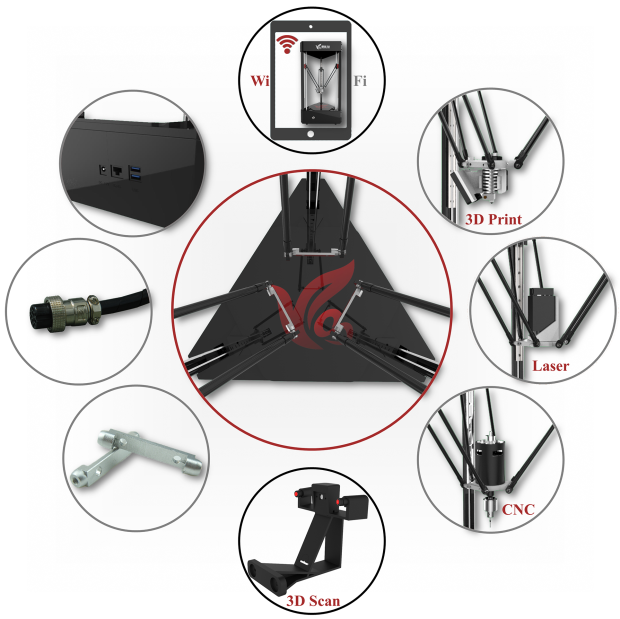 The design of quick setup makes 3D scanner portable and efficient for installation. In addition, you have many options to output the results, making it more convenient for modification and much more practical in DIY. The Raspberry-Pi, an open source hardware built in Ares, is the central processing unit, much like the brain that controls Ares. 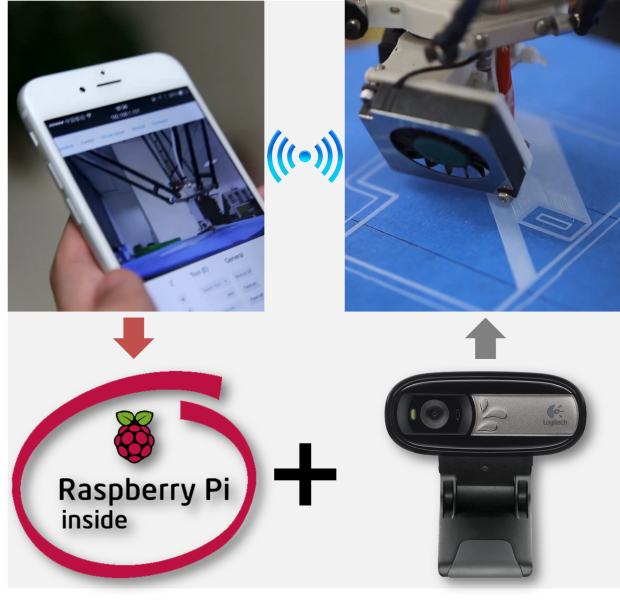 Thanks to the support of WiFi, Raspberry-Pi makes it possible to achieve remote control and monitoring of your printer just by following our simple instruction and configuration, much easier than ever before. Surprisingly, you even may need't purchase a monitor for this function, just unplug the webcam from your computer instead, if available. It is especially convenient for office workers like you and me, isn't it?